The last twenty five years have seen a wonderful revival of interest in the music of the Borders and this is due, in no small part, to the pioneering work of Gordon Mooney. Gordon was one of the founding members of the Lowland and Border Pipers' Society which has since done much to promote the playing of 'Cauld Wind Pipes'. 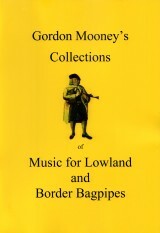 Possibly the two most important of Gordon's collections of Border music were 'O'er the Border' and 'Choicest Tunes'. Both have been out of print for many years and the Society takes great pleasure in producing this combined collection. These were seminal works and deserve a place in any bellows piper's library. The book comprises 72 pages which include settings of 95 tunes as well as comprehensive background notes.